What is summer in Maine all about to this girl? The Yarmouth Clam Festival! I’m not confident that I’ll be able to adequately describe what has made this festival so special to me, but I’ll do my best. Always beginning on the third Friday in July, this year The Yarmouth Clam Festival will be Friday, July 19th – Sunday, July 21st. It’s been several years since I’ve attended the festival (living in NC has put a damper on that), but I remember going every year, or close to it, as a child, teen, and young adult. For me, the atmosphere at the festival embodies the best of Maine and its people – it’s welcoming and relaxed, while bustling with attendees and activities. It highlights arts and crafts, local musicians, and dishes up great food all prepared by Yarmouth-based non-profits – so when you’re buying those fried clams, you’re also making a donation. With family scattered throughout southern Maine, it’s no real surprise that one of my mom’s siblings settled in Yarmouth – my Aunt Nancy and her husband, my Uncle Chris. Their home in Yarmouth was one of my favorite houses to visit – old, big, and rambling, I used to love venturing from room to room. It was also conveniently located for parking and walking to the festival – whether we all went together or as smaller groups. Admission to the festival is free, which is something I simply took for granted before but I now recognize as unusual and special, and all proceeds from food booths and parking lots support Yarmouth’s non-profit student, sporting, music, church, and community service organizations. What I remember most vividly about attending the festival as a child is wandering along row after row of arts and crafts booths. While we certainly enjoyed numerous carnival rides, watched the parade, listened to live music, and indulged in a variety of foods, the simple pleasure of browsing through pretty things in th0se booths stands out boldly in my memory. It’s a lovely, relaxing way to spend a bit of time on a Maine summer day – drifting from booth to booth – supporting these local artists. Then, when you’re ready for a meal and more excitement – you simply trek over to the food booths and grab a plate. At this festival, I typically go for fried clams and french fries with a nice dose of salt and vinegar, but there are plenty of other options including non-seafood items. In addition to food, crafts, and music, the festival has a number of events – check out the schedule here – including a parade on Friday night, a five-mile road race and kids’ fun run on Saturday, canoe and kayak races, and of course, the Maine State Clam Shucking Contest. Maine is full of hard working, dedicated people who are always ready to offer a warm welcome to a newcomer. Perhaps it’s this sense of welcome and community that makes The Yarmouth Clam Festival one of my favorite events. I hope you’ll go and experience it for yourself! Categories: Drink, Eat, Play, Shop | Tags: arts, carnival, clams, coast, crafts, Maine, race, seafood, Yarmouth, Yarmouth Clam Festival | Permalink. 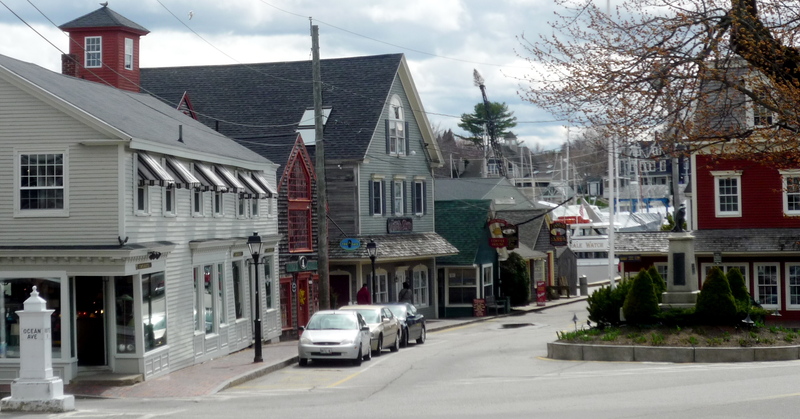 Mark your calendars… for the Kennebunkport Festival 2013! For many years, the Maine summer event at the forefront of my mind has been the Yarmouth Clam Festival (which will be July 19th – 21st this year). I loved going as a child, as a teen, and a young adult- but more on that to come. Recently, Twitter activity (follow me @mainerootsgirl) about the Kennebunkport Festival has piqued my interest – so I did some digging. The Kennebunkport Festival 2013 is June 4th-8th and is produced by the staff of Maine magazine and Maine Home+Design magazine. Their intent, per the ‘About’ page, is to showcase the finest of Maine – fine art, fine dining, and fine wine. Set in charming Kennebunkport, Maine, the festival includes dinners at private residences, special events hosted by restaurants and other venues, art viewings, and live music. For a full listing of events or to purchase tickets, click here. Where the Yarmouth Clam Festival has a casual, family-friendly vibe, the Kennebunkport Festival strikes me as an opportunity for adults to explore and enjoy the upscale side of Maine – I envision sundresses and cocktails, oceanside. And oh, how I wish I could be there! Categories: Drink, Eat, Play, Shop | Tags: art, food, Kennebunkport Festival, Maine, summer, wine, Yarmouth Clam Festival | Permalink.